The mid 19th century chess master witnessed a new era in chess. Traditionally chess was contested in one on one matches between two players of similar strength. The medieval masters would typically play for stakes and for prestige. The 1850s saw the dawn of tournament chess. Strong fields of the world's top players would come together to compete in a league format for prize money. The new format would shed new light on the true state of the hierarchy in chess. Traditionally a match between two protagonists would settle any doubt about who was superior. The tournament era brought even more clarity than ever before. From now on players would regularly lock horns over the board in round-robin format. The results of these championships over an extended period gave a reliable read on who was top dog. Adolf Anderssen (July 6, 1818 - March 13, 1879) was a German chess master. He was the unofficial World Champion between 1851 and 1858. He regained this position in 1861 and retained it until 1866. He was briefly replaced as the world's best in 1858 by Paul Morphy. Anderssen only regained the top slot because Morphy, who was a stronger player and had beaten Anderssen decisively, walked away from the game. He was beaten by Wilhelm Steinitz in 1866 and Steinitz went on to dominate the game for years. Anderssen is fondly remembered for his brilliancies. He won through at times on the back of ingenious sacrifices. None more so than in the Immortal Game (1851) and the Evergreen Game (1852). Daniel Harrwitz (29 April, 1823 - 9 January, 1884) was a German chess master and he arrived on the scene at a time when German chess was on the up. He was born in Breslau (now called Wroclaw), a city that is now in western Poland. He moved to Paris and began to play regularly at the Cafe de la Regence, establishing a formidable reputation there. He crossed the English Channel in 1846 to play the English master Howard Staunton. Staunton won it, even after giving Harrwitz odds in most of the games. Paul Morphy came to Europe in 1858 to take on strongest masters in England, France and Germany. Harrwitz faced him in Paris. He started well with two wins but withdrew when Morphy began to overwhelm him. Henry Bird (14 July, 1830 - 11 April, 1908) was an English master who developed Bird's Opening which starts 1.f4. He also wrote the chess work Chess History and Reminiscences. He was strong enough to be invited to the London Tournament of 1851 which included the 16 strongest masters in the world. Bird was one of the English masters to face Paul Morphy during the latter's tour of Europe in 1858. Morphy was too strong and won the match. Bird's Opening was not his only contribution to chess theory. He also came up with Bird's Defense in the Ruy Lopez Opening which goes 1.e4 e5 2.Nf3 Nc6 3.Bb5 Nd4. Paul Morphy (June 22, 1837 - July 10, 1884) from the United States was known as The Pride and Sorrow of Chess. Many people credit him with introducing positional ideas and championing rapid development in the opening. He was hailed as the greatest master of his era and an unofficial World Champion. Morphy was born in New Orleans, Louisiana. His father was a Supreme Court Justice. Morphy learned to play chess by watching others play. He was a rare gem born with a gift and it was not long before his precocious talent shone through. By the late 1850s even Adolf Anderssen, considered by many at the time to be the world's best, had to admit that Morphy was stronger. But Morphy became disillusioned with chess at a young age and quit when he had the world at his feet. Joseph Henry Blackburne (10 December, 1841 - 1 September, 1924) was an English master who ruled British chess between 1870 and 1900. Nicknamed the Black Death, he only learned the rules aged 18 when he heard about Paul Morphy's reign of terror throughout England that year. Blackburne became champion of the Manchester City Club just a year or two later. His next step was to compete in the 1862 London International Tournament. It was the first tournament to be played in league format. He did not top the table but did beat Wilhelm Steinitz in their game. Blackburne won the British Championship for the first time in 1869 and dominated it for 30 years after. He was also consistently in the top five in the world during that period. Only Steinitz, Lasker and Zukertort were superior. Johannes Hermann Zukertort (7 September, 1842 - 20 June, 1888) was a German chess master who wrestled with Wilhelm Steinitz for 15 years to rule world chess. He also excelled in other fields. He was a talented musician, journalist and linguist. After 3 hard matches against Adolf Anderssen, winning the first and third, Zukertort had finally surpassed him in the early 1870s. Now only Steinitz remained to be overcome. Steinitz recorded a convincing win over Zukertort in London in 1872. Steinitz and Zukertort were the only two players to be considered when the first official World Championship match was finally organized. Zukertort lost the famous match which also pitted his Romantic Era against Steinitz's new Modern Era. Zukertort took ill suddenly and died while in the middle of a tournament just two years later. Another of tragic figure of the chess world. Mikhail Chigorin (12 November, 1850 - 25 January, 1908) signaled the dawn of a new rising chess super power in Europe. First it was Spain, then the torch passed to Italy. France was next to lead the way. Then Britain followed by Germany. Now Russia was emerging. Chigorin was born just outside St Petersburg in 1850. He was the last of the great advocates of Romanticism. He believed in the old school of artful combinations over what was then seen as the methodical dull, grind of positional chess. Chigorin's great success in chess served as an inspiration to his country. He did not quite make it to the top, losing two World Championship contests narrowly to Steinitz. But Chigorin is regarded by many Russians as the inspiration for the Soviet School of Chess which became a relentless conveyor belt of Soviet chess superstars. Isidor Arthur Gunsberg (November 2, 1854 - May 2, 1930) was a Hungarian master who contested a World Championship contest in 1891 and was in the top two or three for a number of years around this period. He started out as the player behind the remote controlled chess machine Mephisto. He later became a chess professional. Gunsberg enjoyed match victories over Blackburne and Bird. Then he drew a match against Mikhail Chigorin who had already run Steinitz close for the World Championship. This prompted Gunsberg to challenge Steinitz himself. He lost the match narrowly in New York and his chance to be World Champion had passed. Siegbert Tarrasch (5 March, 1862 - 17 February, 1934) was a German chess master who was dubbed Praeceptor Germaniae (Teacher of Germany). He declined the opportunity to challenge Steinitz for the World Championship around 1890 due to work commitments. He was surely the best in the world at that time, winning major tournament after major tournament. Then Lasker came along and Tarrasch could not beat him. It would be 1908 before Tarrasch would eventually challenge Lasker. He lost the match by five points. Tarrasch did leave his mark on chess theory. He wrote several chess books expanding on Steinitz's ideas like control of the center, the bishop pair and space advantage. He even had something he called Tarrasch's Rule: Rooks should be placed behind passed pawns - either yours or your opponent's. Akiba Rubinstein (12 December, 1882 - 15 March, 1961) was a Polish master who is thought to be the greatest player never to be World Champion. He was to play Lasker for the title in 1914 but World War I put pay to that. Rubinstein wowed the world with his phenomenal talent early in his career. He won tournament games against all major competitors of his time including Alekhine, Lasker, Capablanca, Nimzowitch and Tarrasch. Rubinstein was one of the earliest players to select particular openings with the endgame in mind. He was one of the greatest endgame players ever and was particularly adept in rook endgames. Aron Nimzowitsch (7 November, 1886 - 16 March, 1935) was a Latvian master and probably the third best player in the world from 1925-35. He was also one of the most important chess writers of all time. His classic Mein System (My System) is said to be one of the most important chess books ever written. Nimzowitsch was something of an eccentric character with many amusing anecdotes about him. His annotations are also laced with a sharp wit making his lessons entertaining for the reader. He could not quite find a way to overcome Capablanca and Alekhine but was superior to all others. He emigrated to Denmark in 1922 to escape political unrest in the Soviet Union. It was then that his career began to flourish until his death in 1935. Richard Reti (28 May, 1889 - 6 June, 1929) was an Austrian-Hungarian master, later Czechoslovakian. The town he was born in, then Bosing, now Pezinok, is now in Slovakia. Reti was the second most prominent Hypermodernist after Nimzowitsch. He started out playing in Classic Romantic style, using purely tactical combinations in his play. Later he became a firm advocate of the Hypermodern school. His signature opening, the Reti Opening features the obligatory fianchettoed bishop with minor pieces attacking the enemy center from the flanks. He inflicted a famous defeat on the Human Chess Machine, Jose Raul Capablanca, with this opening. It was the Cuban's first competitive loss in eight years. Reti left us a famous composition in 1921. It was a King and pawn vs King and pawn endgame. The White King, apparently badly placed, can achieve the apparently impossible and stop a runaway pawn, thereby saving the game. The first tournament players brought a new organization to chess. Structured championships replaced sporadic match-ups. Chess fans were getting a much better idea how the top players really compared with one another. The chess world was beginning to pull all of it's fractured pieces together. Progress towards a global title and governing body was beginning to gather pace. Leading players and officials worked continuously on rules and proposals for the long mooted championship. Finally in 1886 the inaugural World Chess Championship took place. 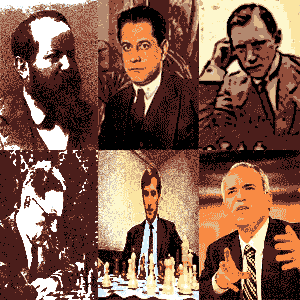 Some of the greatest chess players ever would write the pages of it's long and proud history.